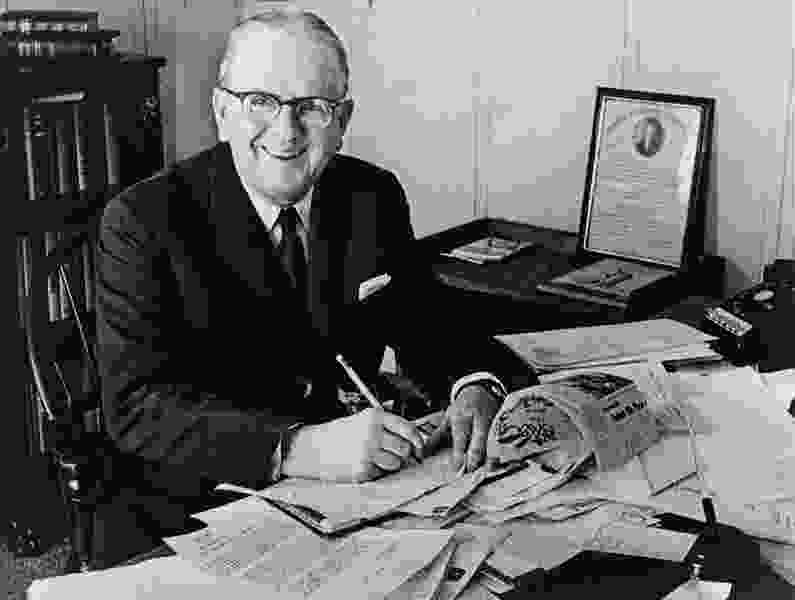 (Courtesy of Religion News Service) Norman Vincent Peale was a Christian preacher and author, most notably of "The Power of Positive Thinking." If Americans ever lived in a Billy Graham nation, they do so no longer. They live now in a nation defined by Norman Vincent Peale, though few Americans today may even know this name. It is Peale’s influence that permeates the cultural landscape. He is a founder of our secular religion of achievement and well-being. His vision is echoed in the mystical certainties of figures like Oprah Winfrey. Even the Trump presidency is confirmation that our country is now Normal Vincent Peale’s America. During the mid-1700s, from Georgia to Maine, the urgent call to reclaim faith in God swept the rising nation. There were prominent preachers, like George Whitefield. There were massive crowds that impressed even Founding Fathers like Benjamin Franklin. There were advance teams. There was fiery newspaper coverage. Tens of thousands were converted, and a “spirit of liberty” was celebrated throughout the land — all just before the revolution that gave Americans a place among the nations of the world. More than one historian has concluded that had there been no religious revival at the time there would have been no American Revolution — at least, not a successful one. It was much the same after the revolution, which had damaged the cause of religion. Firebrand preachers like Charles Finney urged vast crowds to return to the God of their fathers and take their fledgling nation with them. The transforming power of this movement is hard to exaggerate. Entire towns were so impacted that they changed their names to those of biblical cities like Bethel or Shiloh. Benevolent societies arose that endure to this day. This pattern was often repeated. War and cultural crisis were followed by raucous revivals. There would be champions of faith like Dwight Moody or Billy Sunday. Millions were impacted. The media was riveted. New institutions of faith arose. The wider nation could not help but take note. It was this heritage of revivalistic faith that helped feed the stunning rise of Billy Graham in the late 1950s. Americans were urged to return to God and thus to the God of their fathers, to the God who ruled over the American experience. Be born again and in so doing restore the nation to its divine purpose, immense audiences were told. The appeal of this message made Graham’s crusades prime-time media events. He became the “Pastor to Presidents,” the most influential clergyman of his age. Yet even before Graham became prominent, Norman Vincent Peale was fashioning a new faith for a new age. He was a gifted orator who in 1932 became the minister of the esteemed Marble Collegiate Church in Manhattan. Initially, he preached a “born again gospel,” much as Graham would later. His popularity soared as he introduced the wider world to the principles of self-improvement and achievement made famous in his massive bestseller, “The Power of Positive Thinking.” The book made Peale the most famous Protestant clergyman on earth after it was released in 1952. It is the mention of “Science of Mind” and “New Thought” that is most surprising. Clearly, Peale drew from non-Christian sources to fashion his new faith. He knew that “I am what I think I am” and “I am what God makes me” represent two different faiths. Yet he baptized the former statement and offered it as a replacement for the latter before an eager global audience. Indeed, whenever the internet sizzles with admonitions like, “If you can conceive it you can achieve it,” or “Your thoughts determine your destiny,” or “Imagine your way to success,” it is doing so in praise of Peale. Billy Graham called for lives surrendered to God and guided by faith in Jesus Christ. It was the cry of American revivals past. Peale urged men to think the thoughts that fashioned their realities, to remake themselves with words and attitudes and imaginings centered upon success and acceptance. We live in a Norman Vincent Peale nation now. Still, we should not conclude that the Billy Graham tide in American history is at an end. His brand of evangelicalism is much maligned but is ever bent upon resurrection. The heirs of Graham, believing with him that the ideas of mere men fade quickly from history, may yet rise to reclaim the field from the now triumphant heirs of Norman Vincent Peale. Stephen Mansfield is The New York Times best-selling author of “The Faith of George W. Bush,” “The Faith of Barack Obama,” “Lincoln’s Battle With God” and “Choosing Donald Trump.” The views expressed in this commentary do not necessarily reflect those of Religion News Service.